I’m an italian student living and studying at university in London. I’m highly interested in taking part in a volunteer experience in Gaza. It’s months i’ve been looking for sites and gathered information about how to apply. I found this site surfing the internet in my researches. I’m currently working for Amnesty International in London, in a call center as a fundraiser. I’d really like to gain experience this summer. at the moment i’m studying international relations at Birkbeck University in Central London, and I’m attending separately courses about NGOs and International Development. I’m available from August and i’d like to spend at least 2 months in any kind of projects you run locally. I can speak fluent English, Italian as mother tongue, German as intermediate user and Spanish. Is there any particular requirement needed to volunteer there? I’m a flexible person, i don’t mind about the accomodation and facilities provided. Moreover, during the semester october 2006- april 2007 i attend a course for potential volunteers who would like to join an organisation in Sub-saharian Africa. Unfortunately, after the course i couldn’t go to Zimbabwe due to family’s complications. there are quite a few programs, especially in the summer. It depends on what you might be the most interested in doing. The best thing to do would be to direct to you people who are already involved in projects. I would suggest you send your letter to Mazin Qumsiyeh, who organises stays near Bethlehem and Badil, also in Bethlehem. CPT: http://www.cpt.org/ (to see the calendar and requirements) A friend of mine went and said it changed her life. If you would like to go with Italians, there are some groups going. I would suggest joining al-Awda Italia and asking people there for recommendations. Many go there very often and perhaps they can give you far better information than I can! hope you find the trip that is right for you and wishing you all the best! @alaqsa81090 – I keep on getting “Not found” when I click the link. Please post again. It is also on the alaqsa81090speaks (Youtube) under more info on the EM9 vlog clip. 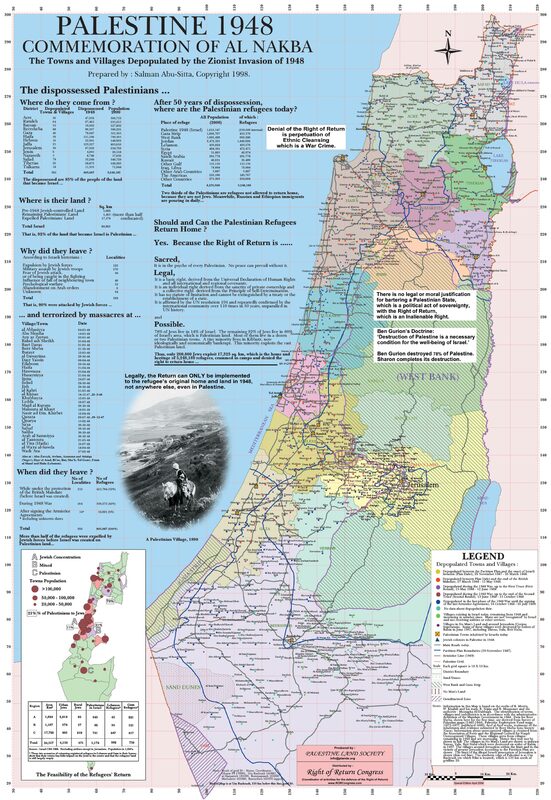 Please where can I find this 1948 map of Palestine. The land of one of the most if not the most brutalized & resilient people in the world. Henri, a friend of mine in Lebanon said it is available in both English and Arabic in bookshops there. You might want to seek some online bookshops, and if you fail in that, we can work out a way that you can contact my friend and arrange to get yourself a copy. I just depend on my handy little printer, although I will one day get a large copy. this map is also included in the Atlas book by Salman Abu Sitta, but it costs quite a bit, and i haven’t bought a copy yet. I bought one as a wedding present for a friend of mine, and he said it was really beautiful, so it might be worth it to investigate getting that actually. I thank you for all your work and i pray for you. Despite my Username, I am a 62 year old male, of part Jewish extraction. I live in Australia and must admit that I was one a supporter of Israel. However their constant aggression and “Nazi like” policies have long since changed my opinion. This was not an overnight conversion, but a slow dawning of the truth. I admire the day to day struggle of the Palestinian people and send them my moral support and best wishes for the future. What caused this loss of so much land? “Palestine” is the biggest example of ‘injustice’ in the history of mankind. Whereby a number of morally bankrupt miserable soul politicans proved their Islamophobia and threw out a whole nation by killing, maiming and injuring its innocent people at the gun-point. In that horrible manner they allowed the devile-worshipper zionists to occupy Palestine and continue th killing business regardless. This was no politics by any virtue, because it was pure and simple THUGGERY. 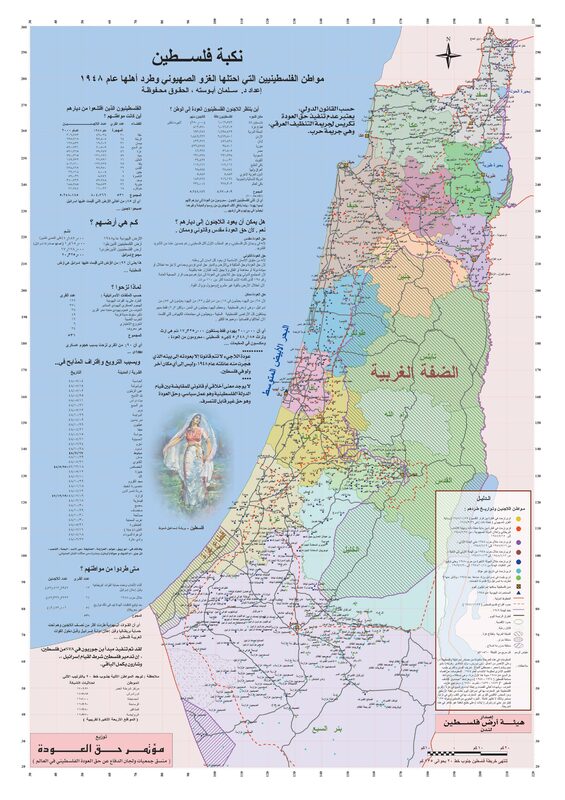 However, it is never too late to make up for their father’s sins and if the off-shoots of those poliical thugs have an iota of decency, they should, through United Nations Organisation dismantal the present political structure of the occupiers of Palestine – declare the state of Palestine restored to its 1946 status – assist the displaced Palestanians to retuen to their mother-land and arrange to allocate to its original inhabitants 50% of all construction errected after 1950 in the land of Palestine. If at all, any zionist does not like that development, that person should be returned where from he or she came to Palestine and the funds for their return expeses should be provided by those countries that have unreasonably accepted in Palestine some other entity. This is the short-cut to all those 60 years of hypocrisy exercised in solving this simple problem. This is “One State Solution a Democratic Palestine for All” to share. Thousands killed, hundreds of thousands made refugees. A NEW WORLD ORDER ! And I can’t get rid of them!!! I read the map, and was inspired by it’s details. I’m not writing to bring up any Zionist propaganda but I am a Zionist and not ashamed of it. I’m in favor of the Palestinians human, civil, and national rights, but not as they are displayed here. the picture here lacks the behavior of Arab states towards the Palestinian refugees from 1948 until today, and the acts of Palestinian leaders during the war. To my knowledge, Israel and Jordan are the only states in the middle east that gave Civil rights to Palestinian refugees (Jordan to all of them, and Israel to its Arab citizens, and even a small portion of the refugees). We may criticise the level of fullfillment of those rights in Israel and Jordan and discern an amount of discremenation against them, but they fare a lot better than any other group of refugees in the arab world. People with civil rights cannot be considered with the same status as people who live for decades in refugee’s camp. In no modern peace treaties refugees were allowed to return to their home, in the way that “the right of the return” is advocated by different Palestinian groups. I am Israeli that supports a Palestinian national state, neighboring Israel Jewish state, in borders close to those of 1967. After decades of peace we might wish to unify Palestine and Eretz Israel under 1 roof, but today we must separate without creating a new crime of evacuating millions of Jews to repent the disaster of the deportation of the Palestinians. The refugees are the result of war. War has it’s horrid results no matter what agreements would be made afterwards. The only way to establish the Palestinian state, in my opinion, is by compromise that will include giving up the demand of return of refugees to territories that belonged to Israel before 1967. I read the map, its really informative. thanks for that.I see that, whenever there is discussion about state of Palestine be established, it is on the borders of the area left after the 1967 war.this is unfair, Palestinians will not get even 30% of th area & this area was occupied by israel after war. if they are really serous for forming the Palestinian state, then it should be on the agreement of 1948 by UN, i.e, at least 46% area should be given to Palestine state.this was the agreement at UN.this is the only solution & step to return to normalcy & peace. if israelies are given right to stay in their country, gather here from different parts of world, then why not Palestinians. they also have the same rights, their dignity also important, if they are not given their due rights, the struggle will continue till the end of this world.there is no best solution than this. Great resource for palestinian rights campaign. Thanks for posting. My feeling about this is that anything is possible provided that Islam and Judaism can reach an accord. At present, it would seem that the right of return carries with it a de facto Islamic State and this would then compromise the Jewish people. And doesn’ty a Zionist expansionist state compromise the arab people? One-state. A Multinational Federation that encompasses arabs and jewish alike witth the SAME rights. No “jewish state” in the same way there should be not any islamic extremist state.